Female Fronted Saat ini memang sudah bukan menjadi pemandangan yang baru untuk kita kenali jika kita kembali ke 10 tahun yang lalu, dimana saat itu, female fronted masih menjadi sesuatu yang " Spesial ", movement Musik yang kian Global seiring perkembangan Jaman dan teknologi sudah tidak menyisakan sekat yang tajam untuk Gender Musik Extreme ini. sejak Sukses kemunculan fronted Angela nya Arch Enemy hari ini semakin banyak Ladies tampil di Urutan terdepan formasi Band metal, At one time, having a female in a metal band was a novelty. Later on, this started to wear off but there were still not many females in extreme metal bands. It was this novelty that lead the Angela Gossow-lead Arch Enemy into a huge amount of success for such an extreme metal band. There have been more and more extreme metal bands with female singers an it appears that some of these bands have been accepted and praised more for the musical talents than the fact that there is a woman singing. dan tentunya potensi mereka sangat tidak bisa kalo cuman dipandang sebelah mata, That is Amazing Talented ! kali ini coba gw kenalkan dengan Female Fronted Band asal Los Angeles, California, DREAMING DEAD yang terbentuk sejak 2006 sebagai ManSlaughter yang lebih memainkan Konsep yang Thrash/Black/Death Metal dan kemudian Meleburnya menjadi nama baru sebagai Dreaming Dead dengan progres Musik menjadi lebih ke Melodic Death Metal gayanya Arch Enemy, At The Gates, Dark Tranquility hingga In Flames ! Frontman band Elizabeth Schall tentu sebelumnya Gw kenal menjadi salah satu Member Atribute Band Cewek The Iron Maidens, kemudian Masih bergabung dengan Death Metal/Grindcore San Jose, California, Cretin, dan pernah memperkuat Black/Death Metal Orange County, California, Winterthrall rasanya cukup menjadi Magang talenta bermainnya untuk tampil mempesona dengan Dreaming Dead bareng Drummer setianya, Mike Caffell. dan sudah sejak awal melihat potensi bagus ini, Label Amrik Ibex Moon Records langsung melirik band untuk merilis Album full pertamanya ini " Within One " yang digarap bareng Enjiner Mick Mullin yang juga pemilik Studio Rekaman Super 8 Studios, Harleysville, Pennsylvania telah sukses menggarap beberapa band Populer dengan Masterpiecenya dan Proses Mixing-nya ditangani oleh Mantan Drummer Grinding Phobia, John Anthony Haddad di studio miliknya, Trench Recording Studio, Corona, California kian menambah Kredit Ngeri Produktifitas album ini. is it the albums of the early 90s where things were slightly progressive in character, of which Death is also a major player? Which ever case may be, the advent of the Gothenburg melodeath trifecta and its affiliates brought in a somewhat different answer, so much so that some dismiss the style as being something other than death metal. " Stairs Into the Vortex " membuka langsung dengan hentakan Melodic Thrash Riffing Headbang yang Ciamik membakar Feel gw dengan Lantunan Headbang part sebelum digempur kemudian dengan Blastbeat Snare, Fantastis memang Progress Riffing Elizabeth Schall terpadu utuh dengan Pattern Vokal yang Signifikan diimbangi dengan backing Vokal Drummer Mike Caffell lebih menambah Poin Dinamis Komposisinya. Sentuhan Death Metal Melodius dengan Flat Tune Harmonizing Black Metal sangatlah bisa gw dengarkan disini. their stylistic departure a year after this came out, and with a more competent screamer. Yet at the same time, it's a bit faster and closer to the thrashing character of more aggressive acts that still manage to be melodic. " Within One " dengan Opening Part yang tetap menggoyangkan Syaraf Kepala untuk stay Headbang ! At The Gates Riffing yang kental mempesona liar menari jemari Elizabeth Schall memang tetap mengagumkan untuk Ukuran Ladies. balutan Solo2 Gitar kecil menambah Hitam Atmosfir musiknya saja. " Putrid Is the Sky " mencoba menanamkan sentuhan Progressive Metal gayanya Opeth dengan Clean Guitar di Opening Track-nya selama menit ke 01:22 yang disambung dengan sentuhan Melodic Death/Thrash Headbang in The Vein-nya Amon Amarth, showcases a brilliant merging of darkness, melodic contour, and aggression that is worthy of any extreme metal's attention, yet also not wholly beyond the realm of someone who doesn't normally venture beyond the level of extremity put forth on a standard Melodic Death Metal. " Shadows in the Dark " tetap terus menggoyang leher Gw ampe Patah dengan hentakan Middle Headbang Part dan menjadi lebih Kacau dengan " Cursed ", Dark Harmonize riffing menyerang menciptakan Atmosfir gelap pada struktur musiknya lebih mengajak kita menikmati gaya Black Metal Typical elemen-nya. This band is very impressive all around and these brothers cannot get much better, but it’s for the better. 8 track yang membutuhkan durasi waktu 41:36 an ini lebih mengajak kita kepada penggalian karakter Awal Band yang sudah memperlihatkan talenta materi selanjutnya menjadi lebih berbahaya. Syalut banget untuk kerja keras Elizabeth Schall menciptakan Riffing2 Fantastis di Album full pertama ini lebih dinamis dan menjauhkan kesan " Minimalis " untuk talenta seorang perempuan di Xtreme Musik metal movement ini. occasional tremolo riffs swirling around the increasingly pounding drums. Other times, the riffs are more similar to death metal or even to thrash metal. The band switches styles effortlessly from one subgenre to another making them difficult to classify. Every once in awhile the band slows things down with a somber melodic interlude. This changes the pace a little bit and keeps the interest of the listener. fans Berat gaya Arch Enemy, At The Gates, Dissection, Dark Tranquillity hingga In Flames siap memberikan Opsi baru untuk kalian nikmati. Her raspy screams and semi-growls fit the attitude of the songs perfectly. At times, she uses a frightening semi-whisper. Though she may not be the most dynamic vocalist and hasn't improved much on subsequent AE albums, this is more than enough to convince me that her vocals are pretty damn evil for coming from a blonde bombshell such as herself. Female Fronted Currently it is not a new sight for we know if we go back to 10 years ago , at which time , the female fronted still something " Special " music movement which is increasingly global and technological era as the development is not leaving Gender sharp bulkhead for the Extreme Music . Successful since its emergence fronted Arch Enemy Angela today more and more ladies appear in leading order of formation metal band , At one time , having a female in a metal band was a novelty . Later on , this started to wear off but there were still not many females in extreme metal bands . It was this novelty that leads the Angela Gossow - Arch Enemy lead into a huge amount of success for such an extreme metal band . There have been more and more extreme metal bands with female singers late it appears that some of these bands have been accepted and praised for the musical talents more than the fact that there is a woman singing . and of course they are very potential can not be underestimated if cuman , That Is Amazing Talented ! 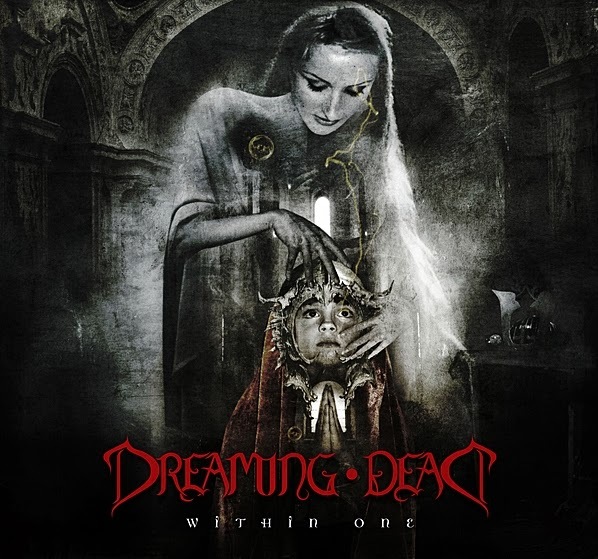 this time i tried to introduce the Female Fronted Band from Los Angeles , California , DREAMING DEAD formed since 2006 as manslaughter even play concept Thrash / Black / Death Metal and then melding into a new name as the Dreaming Dead to progress to the music became more melodic Death Metal style Arch Enemy , At The Gates , Dark Tranquility to In Flames ! Frontman band Elizabeth Schall course before Gw known to be one of the Member attribute Girl Band The Iron Maidens , then still joined Death Metal / Grindcore San Jose , California , Cretin , and has strengthened the Black / Death Metal Orange County , California , it's quite a Winterthrall internship talent to look dazzling play with Dreaming Dead Drummer with loyal , Mike Caffell . and has been since the beginning saw this great potential , Amrik Ibex Moon Records label immediately glanced band to release his first full album " Within One " who worked with Mick Mullin Engineer who is also the owner of Super 8 Studio Recording Studios , Harleysville , Pennsylvania has successfully worked on some bands popular with Masterpiecenya and Mixing Processes handled by his former drummer Grinding Phobia , John Anthony Haddad in his studio , Trench Recording Studio , Corona , California , had only increased productivity Credit Horrified this album . is it the albums of the early 90s where things were slightly progressive in character , of roomates Death is also a major player? Which ever case may be , the advent of the Gothenburg melodeath trifecta and its affiliates brought in a somewhat different answer , so much so that some dismiss the style as being something other than death metal . " Stairs Into the Vortex " opens directly to the beat of Melodic Thrash riffing Headbang ciamik burn Feel gw by chanting Headbang part before then battered with Blastbeat Snare , Fantastic riffing Progress Elizabeth Schall is a unified whole with Vocal Pattern Significant offset with backing vocals Drummer Mike Caffell Dynamic composition adds more points . A touch of melodic Death Metal with Black Metal Flat Tune is harmonizing can i listen to here . their stylistic departure a year after this came out , and with a more competent screamer . Yet at the same time , it's a bit faster and closer to the thrashing character of more aggressive acts that still manage to be melodic . " Within One " with fixed wiggle Opening Part Nerve Head to stay Headbang ! At The Gates riffing thick fingers dancing wildly enchanting Elizabeth Schall is still awesome for Ladies size . Guitar Solo2 small bandage adds Atmospheric Black music alone . " Putrid Is the Sky " trying to infuse a touch of style Progressive Metal Opeth with Clean Guitar in his Opening Track for a minute to 01:22 spliced ​​with a touch of Melodic Death / Thrash Headbang in his The Vein Amon Amarth , Showcases a brilliant merging of darkness , melodic contour , and aggression that is worthy of any extreme metal 's attention , yet also not wholly beyond the realm of someone who does not normally venture beyond the level of extremity put forth on a standard Melodic Death Metal . " Shadows in the Dark " still continued to shake Gw ampe Broken neck with the beat of Middle Headbang Part and become a mess with " Cursed " , Dark Harmonize riffing attack creates a dark atmosphere on the structure of the music is taking us enjoy the style of Black Metal Typical of his element . This band is very impressive all around and these brothers can not get much better , but it's for the better . 8 tracks that require an 41:36 time duration is more invites us to dig character Beginning Band talent show material that has subsequently become more dangerous . Syalut work really hard to create Riffing2 Fantastic Elizabeth Schall in this first full-length album is more dynamic and keep the impression of " Minimalist " for talent in a woman 's Xtreme Metal music movement . occasional tremolo riffs swirling around the increasingly pounding drums . Other times , the riffs are more similar to or even death metal to thrash metal . The band switches styles effortlessly from one subgenre to another making them difficult to classify . Every once in awhile the band slows things down with a somber melodic interludes . This changes the pace a little bit and keeps the interest of the listener . Serious fans of Arch Enemy style , At The Gates , Dissection , Dark Tranquillity In Flames ready to provide new options for you to enjoy. Her semi - Raspy screams and growls fit the attitude of the songs perfectly . At times , she uses a semi - whisper frightening . Though she may not be the most dynamic vocalist and has not improved much on AE subsequent albums , this is more than enough to convince me that her vocals are pretty damn evil for coming from a blonde bombshell such as herself .